A costly joint venture between a property developer and national treasury’s Jobs Fund has raised questions about who’s really benefiting from construction of the Riversands Incubation Hub for small businesses. 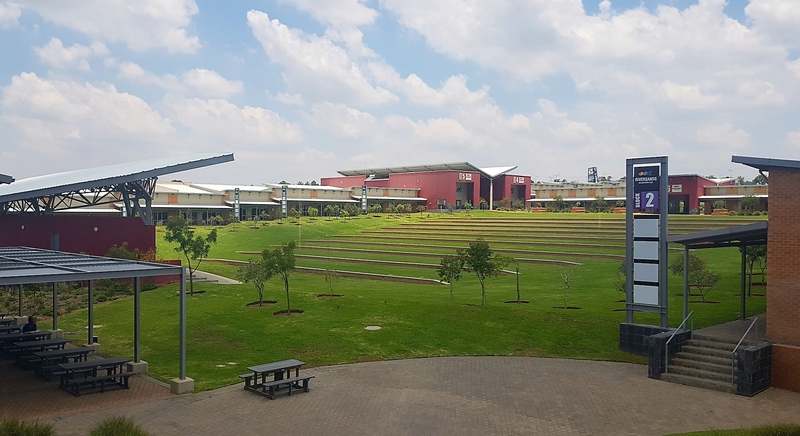 Boasting almost 180 business premises, a business support centre, conference rooms and a 10 000-seat amphitheatre, the Riversands Incubation Hub near Fourways, Johannesburg, is a big development with a big price tag. The hub was built in 2014 as a joint venture between the Jobs Fund and luxury property developer Century Property Development. In 2012, Century won grant funding from the Jobs Fund that matched their investment in the hub rand for rand. In the end the Jobs Fund contracted to contribute R405 971 300 against R520 321 000 in matched funding from Century. The hub was meant to do big things. Originally called the Diepsloot SMME Incubation Hub, it was built to assist up to 178 micro to medium enterprises for three years at a time. According to the Jobs Fund, businesses were intended to come primarily, but not exclusively, from Diepsloot, the underdeveloped and densely populated township north of Fourways. But critics say the incubation centre is an expensive white elephant built in the name of uplifting the township, but really for the benefit and profit of the wealthy mega-developer. 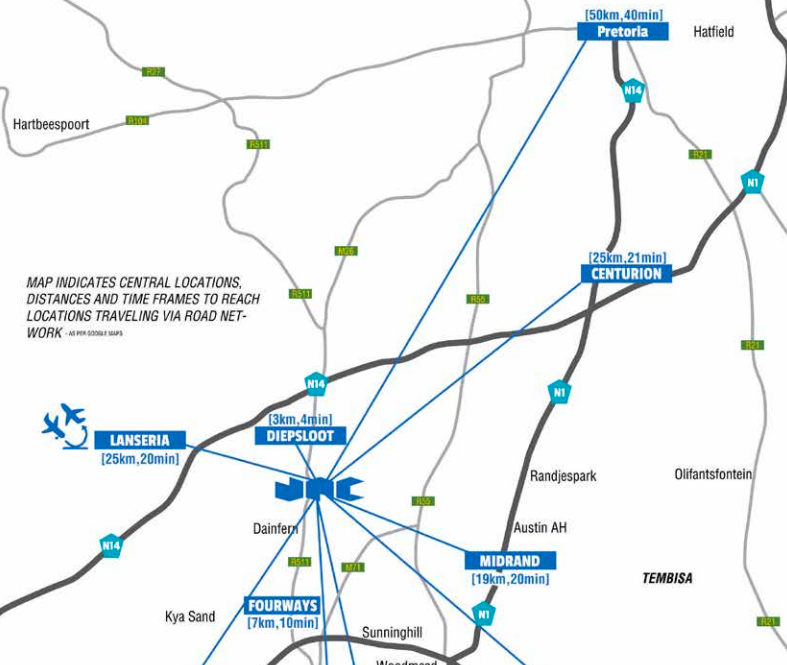 Though Riversands was built for the “primary benefit” of Diepsloot businesses, less than a third of the businesses there are from the township. Management at the hub also does not track how many people employed there are from Diepsloot. Century has retained total control of the hub, and owns the land and the buildings that house it. Century’s chief executive, Mark Corbett, denies that Century profits at all from the hub. He called it the company’s “massive corporate social investment project”. Created by Mark Corbett’s father, Century is the Corbett family business. The billion-rand property development company is known for building luxury townships such as the upmarket Waterfall Estate in Midrand. The hub’s 178 units are 95% full and Jobs Fund head Najwa Allie-Edries said they are happy with how it is operating. The fund set a job creation target of 1 440 permanent and 1 026 short-term jobs for the hub’s implementation phase, which will end in September 2019. According to the fund, the hub has created 982, or 70%, of the 1 440 permanent jobs set as a target for the current implementation phase ending in September 2019. That works out to nearly R1-million per job created so far. But both Corbett and Allie-Edries said the hub’s full job creation potential depends on the private development that Century is building on its land around the hub. They expect the hub to surpass implementation phase targets and remain sustainable because the larger development will create an employment boom. Century has already begun construction on the wider Riversands Commercial Park, which will include premises for light industry, warehousing, logistics, commercial, retail, show rooms, schools and residential use. “Once the full retail park has been developed more jobs will be created through the incubation hub activities as well as the retail park,” said Allie-Edries. Mark Corbett (CEO Century) and Jenny Retief (CEO Riversands Incubation Hub). Century’s website says the commercial park will create 27 000 jobs. The Riversands SMME Incubation Hub NPC, a non-profit company jointly sponsored by Century and the Jobs Fund, subsidises rent for the tenants. They have free access to an on-campus business centre and support from a business development team based there. After the three-year incubation period, tenants were to pay full rental or move to other premises. But Jenny Retief, chief executive of the non-profit company running the hub, said that because of years of roadworks on William Nicol, foot traffic at the hub has lagged. So they are offering tenants a fourth year of incubation and subsidised rental. A variety of businesses are based at Riversands, from a car detailing workshop to meat supply, beauty products, TV production, and training and consulting businesses. But Kristin Kallesen of the Greater Kyalami Conservancy Group (Gekco) has misgivings about how the hub operates. Gekco champions the ecological preservation of Kyalami and surrounds, which neighbours Riversands. “It appears to be a business park promoted as an incubation hub,” said Kallesen. Kallesen said her suspicions are supported by the hub’s location “in the middle of nowhere” – 3,5km away from Diepsloot. She also said that few of the businesses operating there are from the township. AmaBhungane visited the hub twice and spoke to about five business owners, none of whom were from Diepsloot and who did not employ people from Diepsloot either. But they confirmed that the development team at the business centre mentors them and offers useful support with bookkeeping and other business skills. 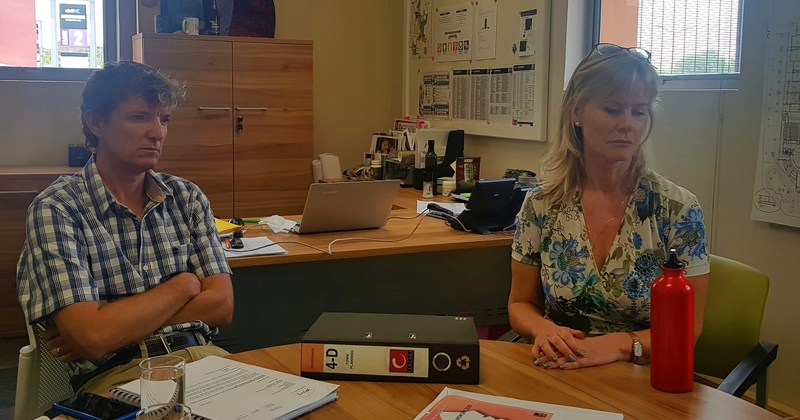 Gekco has had run-ins with Century over environmental infringements on the luxury residential estates the company typically builds in the northern suburbs. The Canvas — the hub’s 10 000-seat amphitheatre. They have also lodged objections to some environmental aspects of the Riversands Commercial Park that is being built around the hub, and oppose the hub management’s use of the hub’s amphitheatre for private events such as parties and concerts. The hub management advertises the amphitheatre as an event venue called The Canvas. Gekco has lodged formal objections to a number of events that caused traffic and litter issues. One particularly rowdy event resulted in damage to some of the business premises. “The land use zoning of the hub is for educational purposes only,” objected Kallesen. AmaBhungane met Century chief executive Corbett and incubation hub chief executive Retief at the hub’s business support centre. They said the hub has never hosted an event that was not approved by the City of Johannesburg’s joint operations committee, which issues permission for public events. Events are one of the pillars that ensure the hub’s sustainability, they said. “Events bring in income, let us extend our services to more businesses and raise the profile of the businesses already here,” said Retief. She could not confirm exactly how much extra profit hub businesses have gained from events. Corbett dismissed Gekco’s objections as elitist attempts to protect the equestrian lifestyle of Kyalami residents who want to “maintain the status quo”. Kallesen denied that Gekco is merely protecting elitist interests, and questioned why the hub is not located in Diepsloot, to be more accessible to businesses and markets there. A businessman from Diepsloot, who insisted on anonymity because the hub issue is “politically sensitive”, agreed that the hub should have been in Diepsloot. He said there was no meaningful inclusion of the local community and accused Century of stealing the idea from local businessmen before intimidating and excluding them. “The work amaBhungane’s doing is important, and has been a long time coming, but the timing is not good for me,” said the businessman, who grew up and still lives in Diepsloot. The businessman said he is a long-time member of Diepsloot business chambers and forums that work to grow industry and business in the township. He and a group of associates had been working on an idea to incubate Diepsloot businesses for over ten years, he said. “We planned to incorporate the surrounding rural areas into a green/sustainable mixed agricultural, light industrial and manufacturing zone,” he said. He alleged that they approached the department of economic development for financial and developmental support, and shared their ideas with former Gauteng MEC Nkosiphendule Kolisile and an official named Chris Vondo, who he said was member of the Johannesburg mayoral committee for economic development at the time. Century recently employed him as a consultant. Though Vondo did sit on the mayoral committee, he denies that his portfolio was economic development. The businessman alleged that Vondo is a friend of former Gauteng Premier Nomvula Mokonyane, who “announced our idea as a partnership with Century” in her 2013 state of the province address. He claimed that when he and his colleagues raised objections during public participation processes, they were stonewalled and intimidated. Vondo has denied having a friendship with Mokonyane. He told amaBhungane he was employed in the Gauteng housing department when Mokonyane was MEC for housing, and later in the premier’s office when she was premier. Retief said the hub initially tried to collaborate with existing business forums in Diepsloot when they were developing the hub, but found it was a complicated exercise. The primary focus, according to Corbett, is to help businesses with access to information and support. Century Property Development’s annual turnover exceeds a billion rand. For those without that kind of funding, succeeding in business in the townships is often a political exercise. The Diepsloot businessman said he and his associates are ten years behind on their plans because the support and funding that they needed from the government were redirected to Century’s project. He added that they have also had to wait for political conditions to change and sympathetic officials to come into office. He denied that Century wants to avoid local political issues, claiming instead that the company stoked political divisions for its own benefit. The same allegation was made in an article published in The Star newspaper in 2013, which reported that Century sponsored a “pro-Incubation Hub” march by the South African National Civic Organisation (Sanco) through the streets of Diepsloot. The report said Century sponsored the march and paid for loudhailers that marchers used to call out the names of those who had objected to the hub, accusing them of blocking 15 000 jobs from coming to the area. Those whose names were called told The Star they feared for their lives. Corbett told the newspaper he had not realised the march would endanger anyone. To amaBhungane, he said the story was “a gross misrepresentation of the facts”. Through the board of the Riversands Incubation Hub, Century exercises control over the hub. The company has four directors: Corbett, Retief, Tracy Henley and Younous Atcha. All except Retief work for Century. Atcha is the financial director of Century Property Developments, while Henley is Corbett’s sister and oversees Century’s corporate social initiatives. “Tracy has a lot of exposure in the area, having run the Diepsloot Youth Programme for ten-plus years,” said Retief. AmaBhungane asked Corbett and Retief why Riversands did not invite a black business person with experience in the township to represent such a key demographic on the board, instead of the heiress to a billion-rand property empire. “No one wants to join in a formative stage, they don’t want to take the risk,” said Corbett, of local black business people. They did not name the black business experts Riversands had invited to join the board. National Treasury established the Jobs Fund to support innovative projects and approaches to job creation. The fund issues calls for proposals from the private, public and non-profit sectors. Jobs Fund Head Allie-Edries said the Incubation Hub is an example of a successful joint venture between the private and the public sector, but insisted that the contract between Century and the Jobs Fund – which details exactly how the R406-million of public money was to be spent on the project – is confidential. AmaBhungane also asked Corbett for the hub’s financial statements, but he said they were covered by a confidentiality clause that the Jobs Fund had to waive. When amaBhungane asked Corbett to indicate to the Jobs Fund that Century is happy to allow disclosure, he did not reply. Despite investing R325-million in the construction of the hub, the state does not own any of its buildings or facilities. They belong to Riversands SMME Incubation Hub, the non-profit company under the directorship of Century employees. Allie-Edries also said that Century owns the land the hub is built on, and leases it to the hub for R1 a year. The balance of the Jobs Fund grant, R81-million, is for operational costs at the hub, including the rent subsidy. The fund monitors operations at Riversands through quarterly audits and regular visits. Was the hub a convenient ploy to marshal support for the much larger commercial property project? On their website, Century describes Riversands Commercial Park as “an integration between certain government departments and the private sector”. Corbett told amaBhungane that it is a completely private initiative. He said Century collaborated with the City of Johannesburg, the Gauteng department of roads and private developers involved in five other nearby developments to bring bulk infrastructure such as electricity, water and roads to the area. In a 2014 Saturday Star article, Kallesen reportedly called the arrangement “a collusion of developers” who want to push the edge of urban development further and further and are “forcing the hand” of the roads department to comply with their development plans. “They provide funding for sections of the road network with direct access to their developments,” said Kallesen. She suspects that the inclusion of the hub within a private development is a stalking horse or clever “spin” to ensure government is invested in servicing the development with bulk infrastructure. The road network currently being built to support Riversands Commercial Park costs R1.4-billion. Corbett did not specify how those costs have been shared between stakeholders. He also insisted that construction of the Riversands commercial development and surrounding road network are in line with the City’s regional spatial development framework, produced by the council in 2008 and amended in 2013 to include Riversands Commercial Park as a mixed-use node.